So here it is. The circle is round. 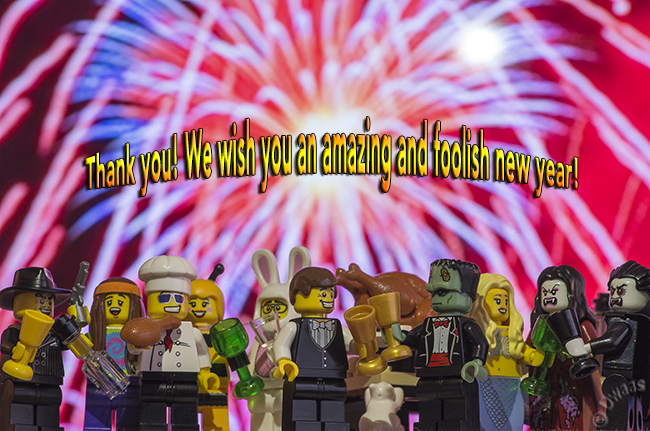 We (the ‘cast’ of Foolish Lego) started with a toast and so it will end, and all the main characters of the past year joined in this time (give or take a few). It was a ride this year. Not always easy I must say. It turned out quiet the challenge to get a photo each and every day! Especially when I was out of the country (the customs-officers looked kinda strange every time I went passed them with a big bag of Lego minifigs). But all in all, looking back it was such a fun year and such a great project to do. I’d like to thank my love for her enthusiasm and criticism…. and letting me make a mess with Lego… all over our house… all year long… for the sake of Lego-art 🙂 I’d also like to thank my little mouse (my daughter of seven years old already) for all the ideas, incredible fun, interest and playing together with me (in order to get new ideas of course 😉 ) And of course I’d like to thank you all for following this project and all the wonderful comments, suggestions and support (on twitter, e-mail, irl, etc… ). I’m also thinking about how I can improve and maybe expand this site, so any suggestions are welcome! For now I’d like to wish you all an amazing new year and I hope to see you back here next year. Cheers! Cheers to you and your effort! It was a great ride. Thanks! (via twitter) well done, it’s been fantastic!!! Congratulations and thank you , you did a great job . Thanks for the great journey! A fantastic year of Lego photography, I must say. You have encouraged many of us, and you have taken some smiles from me :). Congrats to you and your family for this year, for this work, for every pic that you have made. You must be happy with the website :). And I am happy to read that you will continue taking Lego Photos. Thats good news. At first i thought you would finish up with the project at all. Thank you so much for being you, for being Foolish or Dwaa or whatever the person is managinf this. Strange beginning, amazing continuing, brilliant ending.